The consistency of the Dynamo Math framework was conducted independently by the University of Oxford and led by Dr. Ann Dowker (2016). 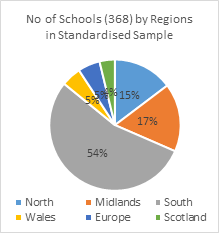 The study used the assessment data collected from 3465 students in 368 schools across England, Wales, Scotland and Europe (English-speaking schools). The analysis showed all the components in the NumberSenseMMR® framework correlated significantly at (p < 001) with one another. Standardized scores allow comparison of an individual’s performance with well-defined reference groups. The normative scores are sometimes referred to as standardized scores. The standardized score indicates the degree to which an individual’s score deviates from the average for people of the same age. The scale is based on the ‘normal‘ distribution of scores that would be expected within the population, and is calculated on the basis that the overall mean (average) standardized score is 100 and the standard deviation is 15, so that about 68% of people will score between 85 and 115. The data extract was confirmed as results from tests administered online independently carried out at schools by SEN Coordinators, Math Coordinators, Class teachers and Higher-Level Teaching Assistants. 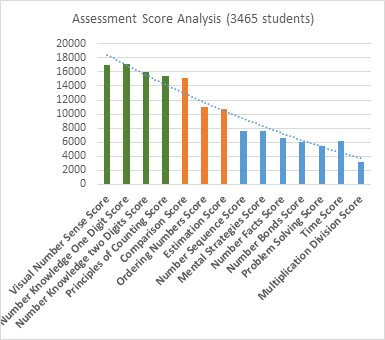 A sample of 3465 students was used for the standardization of the Dynamo Math Assessment. 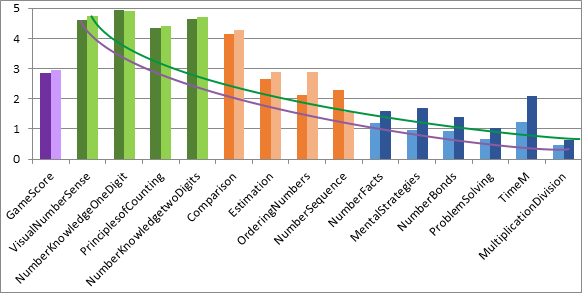 The whole represented the collective three stages attainment in all of the NumberSenseMMR® framework components and the component measurements were taken as raw scores. The data sets were grouped in seven sets for the purposes of analyzing Standard Deviation and Mean. The seven groups were grouped in Ages 6, 7, 8, 9, 10, 11, and 12+ shown in Table 2 below. 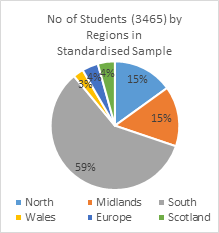 The student results were stratified by the NumberSenseMMR® framework components and were not based on Key Stage results, as this information was not available in the same format. 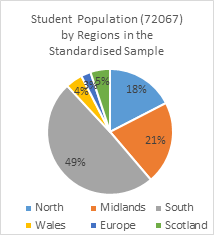 The gender split in the data represented 52% male and 48% female students. The detailed split by age is shown in Diagram 2 below. Standardized approaches depend on curriculum-based definitions of typical arithmetical development, and how children with low numeracy differ from the typical trajectory. This shows that a small improvement made in the Number Meaning and Number Magnitude stages brought a large improvement in the Number Relationship stages (Math Foundation).